For sale is this awesome McIntosh C20 tube preamplifier, considered by many to be the finest tube preamp McIntosh ever made. It has been thoroughly cleaned and serviced by an exceptional tube tech with all voltages checked and confirmed to be within spec. All controls have been cleaned and work perfectly/silently. Cosmetically, it's in very good condition but does have some oxidation and pitting on the top and back, which is typical of these older Macs. The faceplate is clean with no cracks. All of the tubes test strong and should be good to go for years to come. 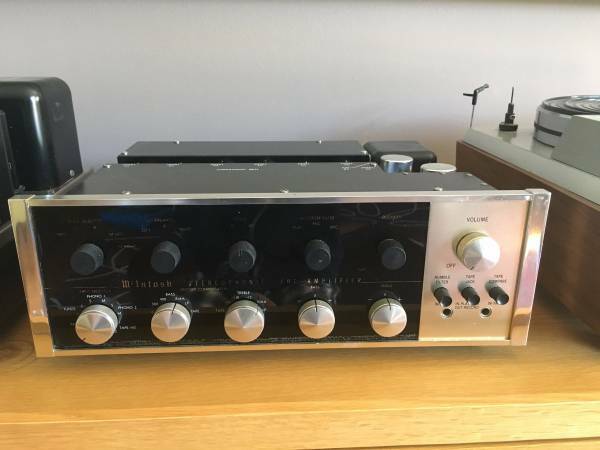 I believe the 12AX7s and 12AU7s are Telefunkens, but I can't be 100 percent sure. The silkscreening has worn off them, but they have the telltale Telefunken diamond in their bottoms. I've been using this amp daily and it sounds fantastic. It's plug-and-play and ready for a new home. Asking $2650. I'm in Northern Virginia and would prefer a local sale, but I'm willing to ship if necessary. I'd prefer a cash deal, but I might consider a trade or partial trade for the right speakers.